Sean Massey was born and raised in Norman, Oklahoma. At the age of 18, he moved to Denver, Colorado to attend Culinary School at the Art Institute of Denver. After graduating, he moved to Palm Beach to work under Hubert Des Marias at Four Seasons Palm Beach. After two years, Sean moved to Four Seasons Maui in Wailea, where he spent time working at Duo Steak House and Ferraro’s. While in Maui, Sean also received a second level Sommelier certification from the International Wine Guild. After four years in Hawaii, Sean accepted a position at Morimoto Napa, Chef Morimoto’s signature restaurant. During his time at Morimoto Napa, Sean was sent to London to open a pop up restaurant with Chef Morimoto for the 2012 London Olympics. After three years of working at Morimoto Napa, Sean spent time at two Michelin starred restaurants in the Napa Valley, Redd and Auberge du Soleil. 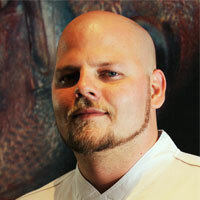 In the fall of 2013, Sean joined Morimoto team again to become the Executive Sous Chef at Morimoto Maui in Wailea. Given his familiarity with the area and his fondness for Chef, it was an easy decision to return in that role. After eight months in Maui, Chef Morimoto promoted Sean to be Chef de Cuisine of Morimoto Napa and in the Spring of 2017, Chef Morimoto promoted him to executive chef. Since his return to Napa, Chef Sean has been involved in the openings of Morimoto Bangkok, Morimoto Las Vegas and Morimoto Asia in Orlando, Florida.